There's not a lot to say about The Rescue really. It's purpose is to introduce us to Vicki (Maureen O'Brien) who is lined up to take the place of Susan. The production team obviously felt that a teenage girl was an essential requirement. So this two-part story introduces us to Vicki and gives Maureen O'Brien a chance to run through a whole range of emotions - from scared to happy to angry - and complete what is, essentially, a long audition piece. Vicki is an orphaned survivor of a spaceship crash and a massacre on the planet Dido. Her only companion is the badly injured Bennett (Ray Barrett). They are stalked and threatened by the spiky Koquillion. It will turn out that there's more than meets the eye to this whole scenario. Except actually it all seems pretty obvious to me. 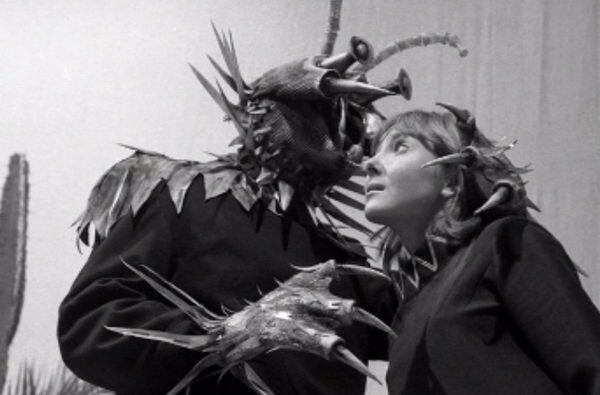 The final confrontation between the Doctor and Koqullion is nicely done - and it is always lovely when a monster that looks like a bloke in a mask turns out to just be a bloke in a mask - but it is all a little signposted. And I've probably spoiled it for you now. Tut. That's about it really. There's an apparently misunderstood monster called Sandy, which Barbara effectively misunderstands to death. But as I said this is all about Vicki. And O'Brien is rather good on her first appearance. It's pretty obvious that they're not straying too far from the Susan model, which may be a problem further down the line of course. She given enough to do to show that she's a good enough actress and there's a certain charming cynicism to her reaction to being told that the Doctor is a time-traveller and her reaction to the inside of the TARDIS is well-played too. The first new reaction we've had to the 'bigger on the inside' nature of the TARDIS since the first episode. So I'm expecting good things of Vicki / O'Brien. Hartnell's rather good in this too. He gets a nice balance of comedy and drama. He also gets to be Sherlock Holmes-ish again, which seems to suit the First Doctor. Alas Jacqueline Hill and William Russell don't get a huge amount to do, for obvious reasons. Ray Barrett does a fine job too, along with Sydney Wilson as Koquillion. Sydney Wilson is the first example of a kind of casting that will become something of a tradition in the 1980s. Oh, I should note that the model work is rather lovely. Fundamentally though The Rescue has one job, which is to introduce us to Vicki in a sympathetic way. And it is a job it does very well. The funniest thing though is comparing the relatively casual way Susan's departure is dealt with - one lovely speech at the end of The Dalek Invasion of Earth and a couple of references in the first episode of The Rescue - versus the season long, emotional trauma filled arcs of new Doctor Who. Susan was the Doctor's granddaughter for heaven's sake. Not just any old companion. Now the whole season would be filled with foreshadowing and the finale would be packed full of emotional triggers and tears. *I'm assuming people reading this will get that joke. If you don't go and watch Ghost Light.